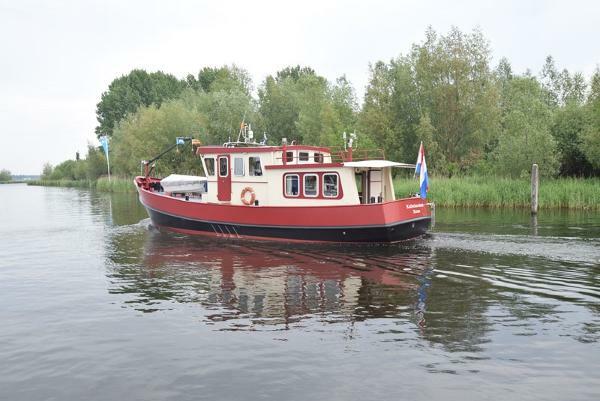 Bekebrede Trawler 16.40Sturdy Trawler designed by Martin Bekebrede with excellent fit for living aboard. This ship is very solid and is in excellent condition. 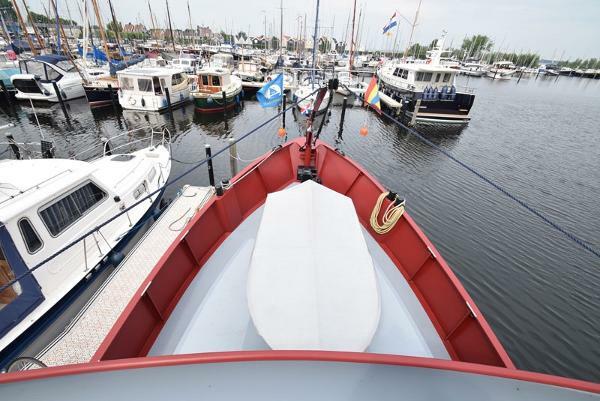 The wheelhouse is spacious and has a headroom of 2.12 meters. Across from the controls is the kitchen and a U-bank situated. 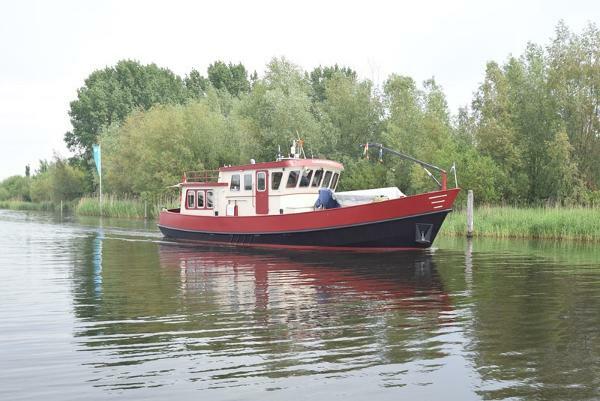 This wheelhouse is equipped with double glazing and has all around visibility. To the aft is the spacious salon with a headroom of 2.03 meters. From the wheelhouse you can walk down a staircase where 3 cabins and a bathroom and a separate toilet are. The corridor and the rooms have a headroom of 1.90 meters. 2 watertight doors are installed in the corridor. The engine compartment is located backwards. The first part of this has headroom. The engine compartment is very neat and everything is easily accessible. The technique is nicely installed and looks very neat. Outside there is a wide passage on both sides from the front deck to the aft deck. The aft deck can accommodate several people. To the front is a spacious front deck where the dinghy is located. In addition, there is also a hydraulic crane and an electric windlass. The underwater hull has recently been inspected and is in excellent condition. The underwater volume is 93 m3, so no CVO certificate is required. Are you looking for a well-maintained sailing ship to live on? Then be sure to check out this Trawler. The VAT has been demonstrably paid. General: Name ship Kabbelaarsbank, Bekebrede Trawler 16.40, length 16.40 m, width 5.00 m, draft 1.40 m, built in 1994, construction number 001, builder casco De Volharding Zwammerdam, completion in own management, designer Martin Bekebrede, steel, keel 10 mm, further corridors 6 mm, multi-chine hull, waterdisplacement 47,000 kg, hydraulic steering, wheel steering, anchor (85 kilo) with 40 meters anchor chain, De Rek & Horsman electric anchor winch (380 Volt), stainless steel swim treads, electric bilge pump, double glazed windows, teak interior trim, 5 berths , 3 cabins, headroom wheelhouse 2.12 m, headroom salon 2.03 m, headroom corridor below 2.00 m, bed length 1st cabin with double bed 2.00 * 1.50, bed length 2nd cabin single bed 1.90 * 0.90 m, bed length forecabin, 2.10 m. Engine: John Deere 6068 TM, 175 hp, construction number T445497, built in 1994, diesel, consumption approx. 12 liters / hour, propeller shaft, Python drive, Twindisk hydraulic clutch, keel cooling with cooling pipes, dry exhaust, 4-blade fixed propeller, hydraulic bowthruster, steel coated fuel tank 2 times of 1.600 liters with gauge glass, tachometer, hour meter approx. 3,200 hours, meters and signal for oil pressure and temperature. Outside: Air draft 4.60 m, with antennas down 4.00 m, hydraulic crane with 400 kg load capacity to lift the tender, winter tent to close the aft cockpit. Navigation and equipment: Light batteries 560 Ah (2017), 24 Volt, shore power connection with earth leakage circuit breaker, Victron Quattro battery charger 24/5000/120, 120Ah, 5000 watt inverter, Mitsubishi S4L generator 2018 (50 operating hours) with Stamford 15 KVA, Windows on-board computer with WinGPS, Navman depth gauge, MLR FX-312 GPS, Icom IC-M411 VHF and Icom IC-M323G VHF, Nasa Target Navtex, Sony radio / CD player, TV, navigation lights. Gas and water: Steel coated water tanks 2 times 1.700 liters, refrigerator, freezer, 4-burner stove (electric halogen), Siemens combi oven / microwave, electric water pressure system with pressurized water, hot water via tap spiral on Kabola HR500, outdoor shower with hot and cold water, indoor shower with hot and cold water, electric toilet, waste water tank steel coated 2 times 225 liters, Kabola HR500 (2014) CV heating. Disclaimer: All information given herein is to our best knowledge and belief, however Yachtbrokerage eSailing declines all responsibility for the quality and/or specification of the boat.